Controlling disease in container gardens is a concern for all gardeners at one time or another. The good news is that because container gardens are more accessible and because we water them frequently, we can find problems before they get out of hand. Taking steps as soon as you see a problem will help save the plant, or keep the problem from spreading. If you take your indoor plants outside for the summer, give them a good shower before bringing them back indoors to make sure you don’t bring disease in container gardens inside with you – other indoor plants may become infected. 1. Don’t reuse potting potting mix. To avoid disease in container gardens, don’t reuse potting soil, especially if it contained plants that were affected by fungus or bacteria. Even if the soil looks fine, it can be contaminated by disease and may also have insect eggs or larvae that can’t be seen. Pitch the soil or throw it in your compost. Clean containers helps prevent disease in container gardens. At the start of each new planting season, scrub your pots and containers in liquid detergent and water. For pots that may have been subjected to garden pests and disease, soak them in a solution of one part household bleach to ten parts water for about an hour. Rinse them thoroughly and allow them to air dry before planting in them. You can avoid many container garden problems, if you always look for healthy plants and rinse them well before planting. 4. Keep your plants healthy. Make sure you give your plants their required combinations of sunlight, fertilizer and water. Healthy plants are just like us – they can fight off disease better if they are healthy. Remove any dead leaves or flowers and make sure they are spaced enough that air is able to circulate around them. 5. Get rid of infected plants. If you find a plant that is polluted with garden pests or disease, isolate it or get rid of it. Don’t let it infect your other plants. While you treat its problem, keep it away from your other containers, and wash your hands and gardening tools after you work with it. Disease in container gardens is more likely to occur with certain plants. Keep that in mind when you select plants for your container gardens. This is especially true of tropical plants or other plants that are not native to your area. They haven’t acquired a natural resistance to all of the garden pests and disease in your area and are more vulnerable. Don’t avoid these plants – after all, that’s an advantage to gardening in containers – just check these plants regularly for harmful insects and take action quickly. Regular plant inspections help head off problems with disease in container gardens. When you water, look at both sides of a few leaves – check the soil for anything that might look moldy too. Remove dead leaves and cut off any dead or diseased looking part of the plants. Handpick insects off the plants if you can. Keep the garden area clean. Don’t let disease in container gardens get established because of a dirty garden area. Keep the area around your containers clean – sweep or hose off decks, patios or porches regularly. Dirty outdoor areas provide a breeding ground for container garden problems. When using chemicals to treat disease in container gardens, or elsewhere for that matter, always wear hand and eye protection. Use a mask and spray on a windless day. Only use pesticides specific to the known pests or disease and only apply to infected areas. Disease in container gardens takes hold when growing conditions aren’t optimal. This is particularly true with disease – they invade when the nutritional needs of a plant aren’t provided. With container gardening, we can control this better. We control the soil quality and the nutrients provided by fertilizing. Using good potting soil and taking care of our plants can eliminate most fungus and disease. 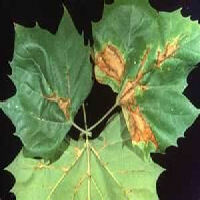 Plant disease is caused by fungus, virus or bacterial. 1. Fungal diseases are most common, but luckily, they spread slowly. If you act as soon you recognize a problem, you can save your plants. Typical symptoms are wilting or spotted leaves, or rot. Fungus is more of a problem when there has been a lot of rain. It likes warm, wet leaves. Both mold and mildew are a fungus. To avoid fungus, remove dead leaves and debris from around your containers. Separate your containers so that air can circulate around them. Move your pots so that plants get more sunlight. Using sprays made from water mixed with milk, baking soda or apple cider vinegar help fungus. Use the recipe above on this page, but add 2 tablespoons of baking soda to it. This makes a good fungicide. Other homemade recipes include adding one of the following to a quart of warm water – 1 teaspoon of mouthwash, 1 tablespoon of hydrogen peroxide. Apply the recipe of your choice with a sprayer and spray once a day until the problem is cleared. 2. Viruses are usually spread by insects. They are not common, but can kill your plants quickly. A plant’s leaves will yellow, twist or crinkle, and then it dies. If this happens, remove the infected plant to keep the virus from spreading. 3. Bacteria causes the rarest form of plant disease. If doesnt easily infect plants. If your plants are healthy, they will ward off infection from bacteria. Bacteria has to enter the plant through a broken leaf or stem. It causes soft rot in the plant tissue. The area will appear slimy. 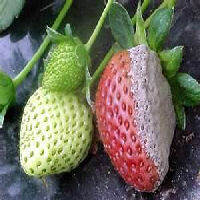 If this occurs, destroy the plant and clean the pot and your gardening tools to prevent spreading. Make sure that your plants are spaced far enough to let air circulate between them. Container garden problems are avoided if you keep the garden area clean, sweeping or hosing fallen leaves, dead blooms, etc. When you water, do so below the leaves and blooms. If you water from overhead, water remains on the foliage and can cause mold and mildew. Make sure your pots have proper drainage and that they stay clear and unclogged. Soggy soil provides a good place for pests and disease or fungus to take hold. 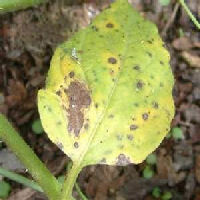 Symptom: Black, tan or red spots on leaves. Leaves yellow and drop. Black cankers on stems, with a general wilt of branch tips. Cause: Anthracnose, a fungal disease that occurs in late spring and summer, typically after humid conditions. Remedies: Remove infected leaves and branch tips. Collect and destroy infected fallen leaves. Thin excessive growth to promote air circulation. Try our homemade recipe in a spray bottle. If something stronger is required, spray with bordeaux mixture – a copper sulfate and lime-based fungicide. 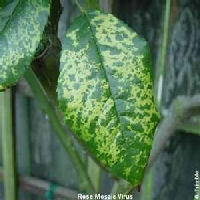 Symptom: Leaves are mottled with black spots, then eventually yellow and die. Powdery black or brown dusting on foliage and blossoms. Leaves may drop. 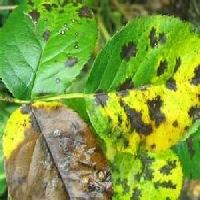 Cause: Black Spot – fungal diseases found on many plants. Common in shady, crowded plantings. Remedies: Space plantings to allow good air circulation. Remove shading foliage. Apply water at base of plant. Strip and destroy infected leaves. Try our homemade recipe in a spray bottle. If something stronger is required, spray with bordeaux mixture – a copper sulfate and lime-based fungicide. Symptom: Flowers wilt, and foliage tips curl, yellow and die. Oozing cankers form at base of shoots with main stem. Affected foliage may have a strong odor. Cause: Blight. Bacterial diseases caused when soil containing bacteria is splashed onto cut and bruised foliage or is carried to flowers by pollinating insects. Remedies: Remove and dispose of affected plants. Apply water at base of remaining plants. Spray with bordeaux mixture – a copper sulfate and lime-based fungicide. 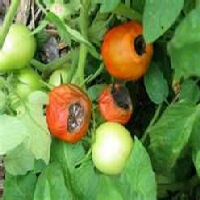 Symptom: Gray scabs form on the blossom ends of maturing tomatoes and peppers. Remedies: Strip affected fruit from plants. Fertilize with a 5-10-10 formula and mulch soil surface with organic compost. Water deeply and regularly. Shade affected plants from hot midday sun. Symptom: Gray, cottony masses and brown-spotted, dying foliage. 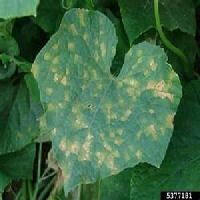 Cause: Downy mildew, a fungal disease common in cool, moist conditions. Symptom: Flowers and foliage collapse under a heavy fuzz of brown or gray fungal spores. Symptom: Streaked and mottled foliage, deformed blooms. Cause: Mosaic virus, an incurable plant disease. Remedies: Remove and destroy affected plants. Promptly control aphids or spider mites which can spread the infection. 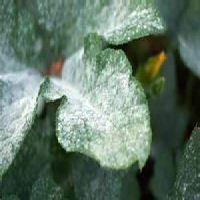 Symptom: Leaves have white to grayish, powdery patches, as though they’ve been dusted with flour. Cause: Powdery mildew – a fungal disease common when days are hot and nights are cool, with high humidity. Mostly attacks new leaves. 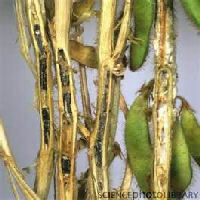 Symptom: Brown stains and softened tissue near base of stem or crown of plant. Leaves may yellow or drop. Cause: Stem rot. Look for decaying stems. Usually associated with keeping soil overly moist. Remedies: Rarely curable. Remove infected foliage. Clean pots and gardening tools. Remember – don’t compost foliage that has suffered from infestations of garden pests and disease. Also avoid planting in pots that have had infections in prior plantings. When pruning plants, make sure your garden shears are sharp and wash them between cuttings – open wounds in plants invite infection. If you need help identifying disease in container gardens, check out the plant pathology series at Ohio State University.